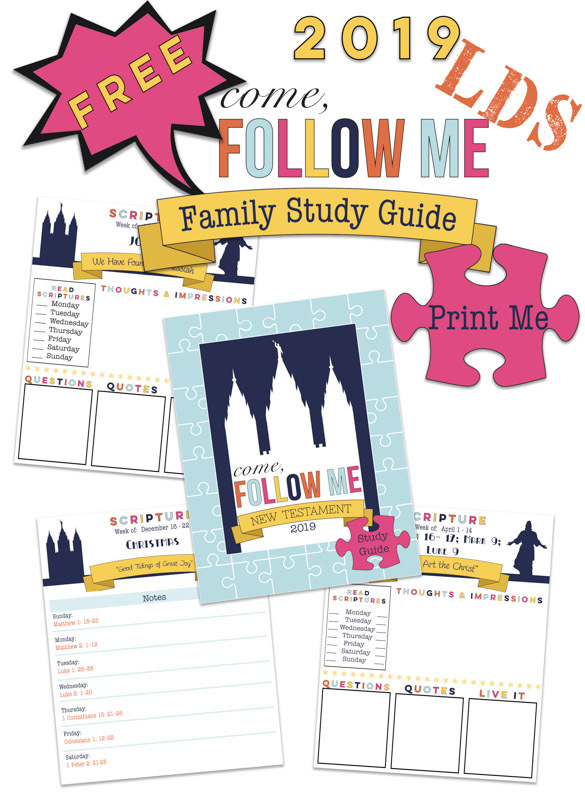 I searched all over for a family study guide for the new LDS 2019 Come Follow Me curriculum, and didn't find anything I liked so I created one for my own family using different ideas and files I found online. 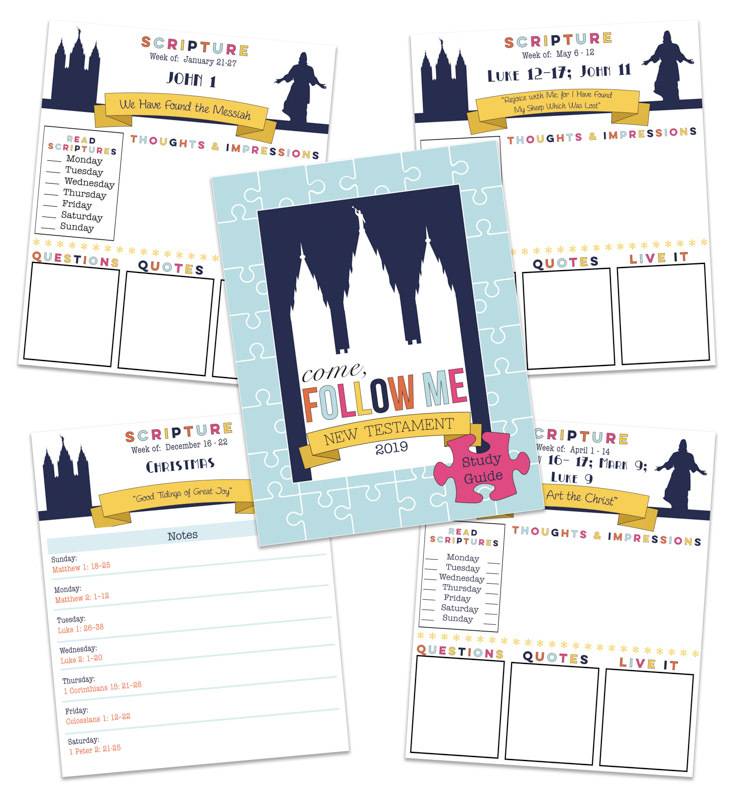 (Special big thanks to Melanie over at Sugardoodle who created the original designs and graphics with her free Primary printables found HERE) She creates some amazing stuff you guys! Each page is broken down by week, and that weeks scripture to be studied. Each page includes a daily chart to mark off that you read your scriptures each day (aside from the assigned scripture study), as well as places to write down your thoughts/impressions, questions, quotes, and a "live it" section to write down ideas on how you can apply the teachings of the assigned scriptures into your everyday life. I left out lines so that younger ones can draw pictures in the spaces. We have our kids fill out their own study guide during their personal study of the assigned scripture that week, then they bring their study guide to FHE where they can discuss what they read/learned, ask their questions, and take notes of anything new brought up. For anyone who wants it, below is a link where you can download all of the files for each week for the whole year (FREE). Also the UPS store can bind the pages for you for a very reasonable price. I don't know about the rest of you mama's out there, but having babies has done a number on my hair. When I'm pregnant, my hair grows like crazy and feels amazing. However, postpartum my hair falls out in handfuls and looks flat and dull. Oh hormones! Add that on to the naturally fine hair that I have and it's a recipe for disaster! 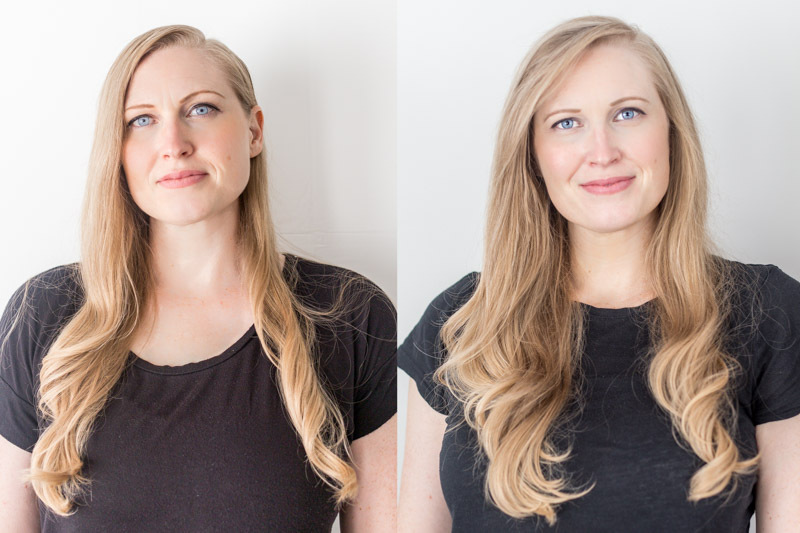 So what would you say if I told you there was a special line of hair care products out there specifically targeted for thinning and hair loss in women? I'll tell you what I said... "HECK YES!" The product lines at Thique Hair are absolutely incredible and smell, oh so amazing! 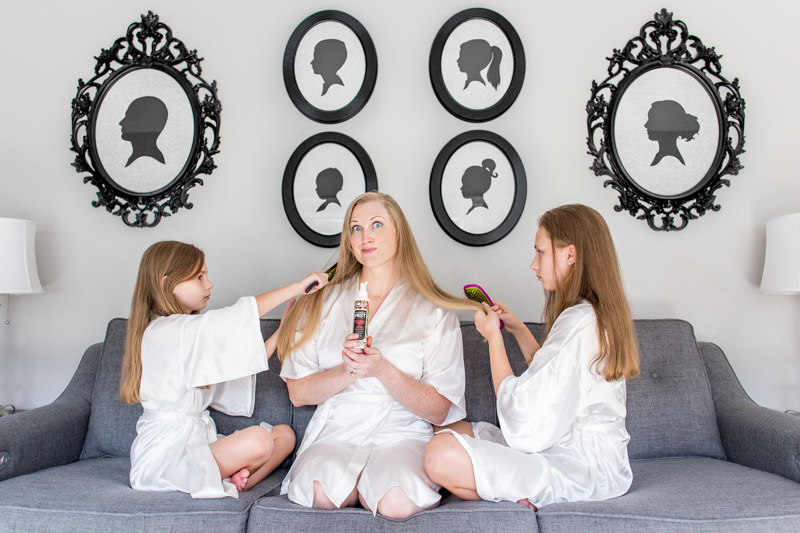 It's formula is derived from all natural plant extracts and essential oils, which we can all agree is much better than chemicals that can cause more damage to already struggling hair. I've been using the Thique Hair Volumizing Mist for a little over a month now and have noticeable improvement in the lift and body of my hair! 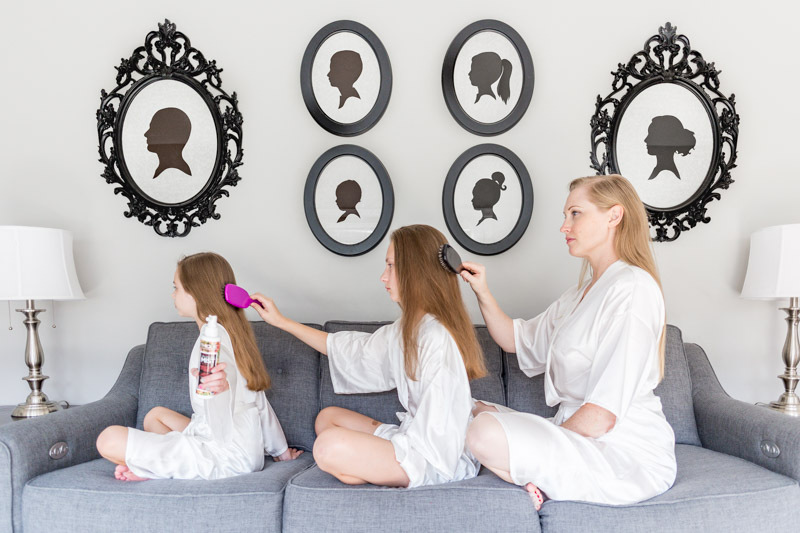 Not only does it add volume and thickness to my hair, it is lightweight, never feels sticky or stiff, and lasts all day with beautiful soft hair you can even run your hands through! If you have thinning or fine hair, boy howdy is this the stuff for you! 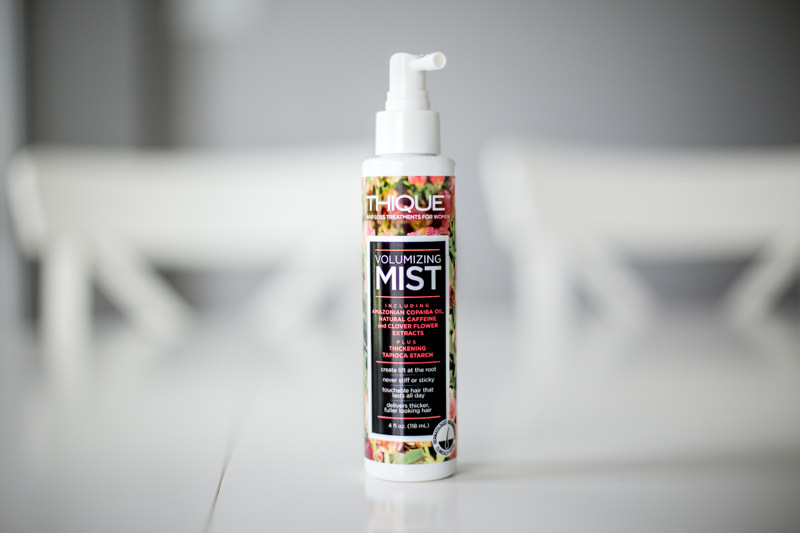 You can get your Thique Hair Volumizing Mist HERE, and check out the other great products from Thique Hair HERE! Let me know your thoughts and experiences with them!! And here's to happy hair, my loves!! I'm a bit obsessed with oral care. Good oral hygiene is one of those things everyone should have but most people don't take the time for. But when you think about it, a good smile and nice breath is pretty important when you're meeting or talking to someone else, AND you've only got the one set of permanent teeth, soooooo taking care of the ones in your own mouth should be pretty high on your to-do list! 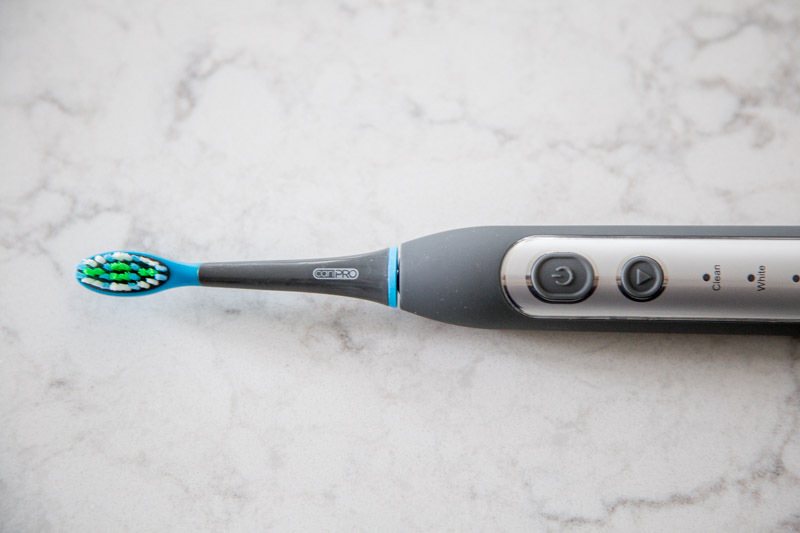 I've tried all kinds of electric toothbrushes, but to be honest, they're expensive and the battery life always bummed me out and without fail, I'd get disappointed and end up going back to manual brushes. Then one day, everything changed! 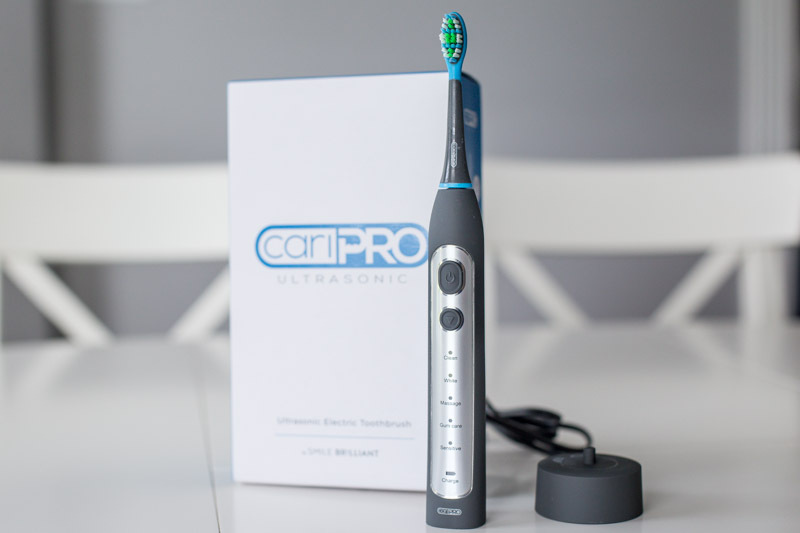 I was contacted by the sweet peeps at Smile Brilliant and asked to try their latest launch- the cariPRO ultrasonic electric toothbrush. HOLY MOLY you guys! This thing is something special! I immediately noticed the quality of this toothbrush! It is solid in design and construction and feels so good in your hand. 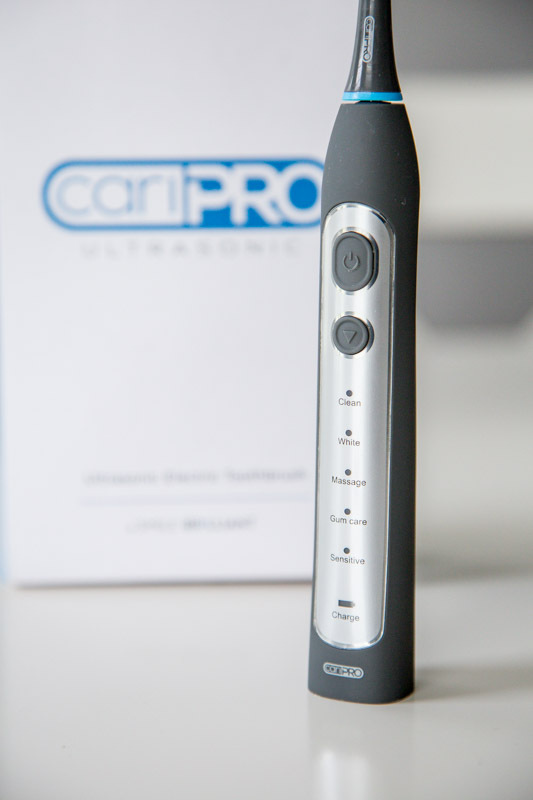 It has a sleek design with a grey soft touch waterproof grip. It operates at 40,000 vibrations per minute for ultimate cleaning action. I personally love the 5 different bush modes you can choose from (clean, whiten, massage, gum care and sensitive). 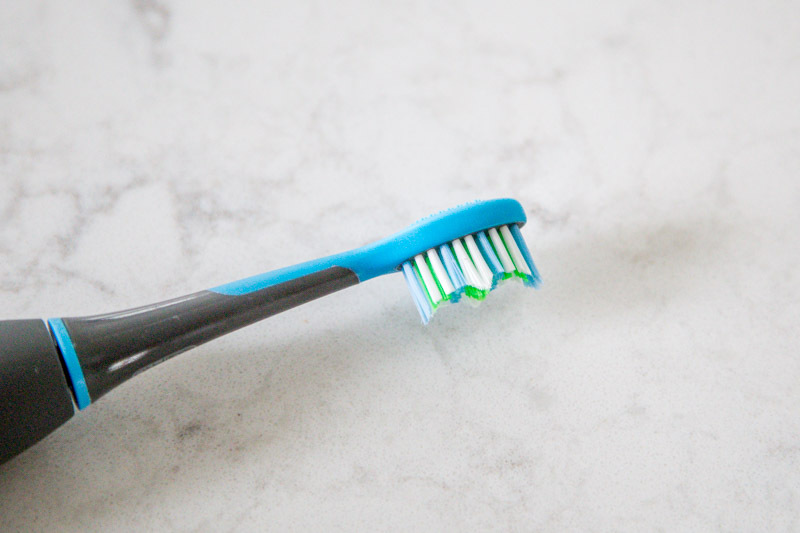 I have extremely sensitive teeth and gums (thank you hyperemesis gravidarum) so I personally have been brushing 2 times a day on the sensitive setting and LOVE it. Very gentle, my gums are never sore and my teeth have never felt cleaner or healthier! It has a fabulous ergonomic head that get's into all of those tight to reach places that deserve all the extra love! I think one of the most fabulous features though is the battery life! 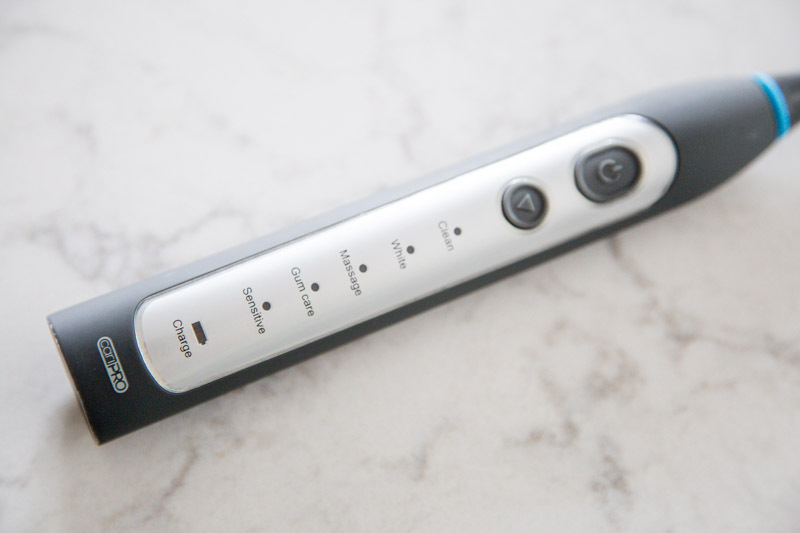 This amazing brush boasts a 30 day battery life on a full charge. I charged it fully on the very first day and it's been almost 3 weeks now and it's still going strong! Game changer!!! AND the charger is a small disk that charges your brush when you set it on it, with no exposed metal. 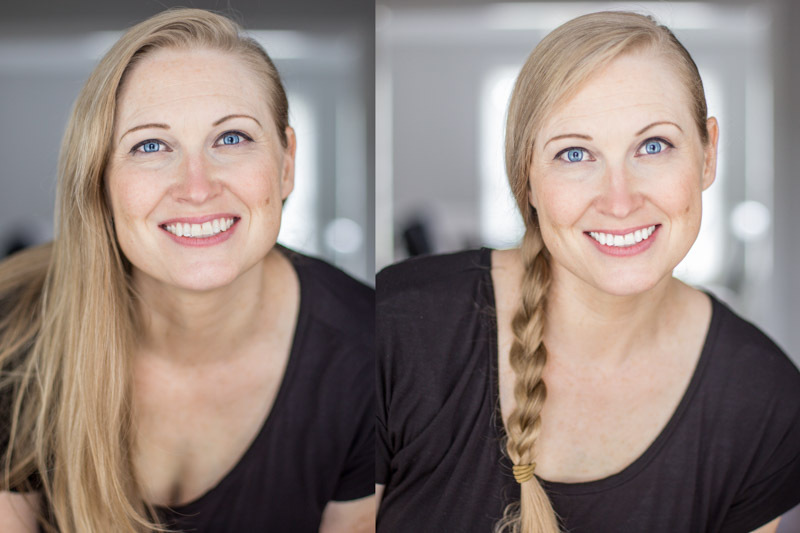 As if this brush wasn't amazing enough already, it cleans so well, my teeth even look whiter! 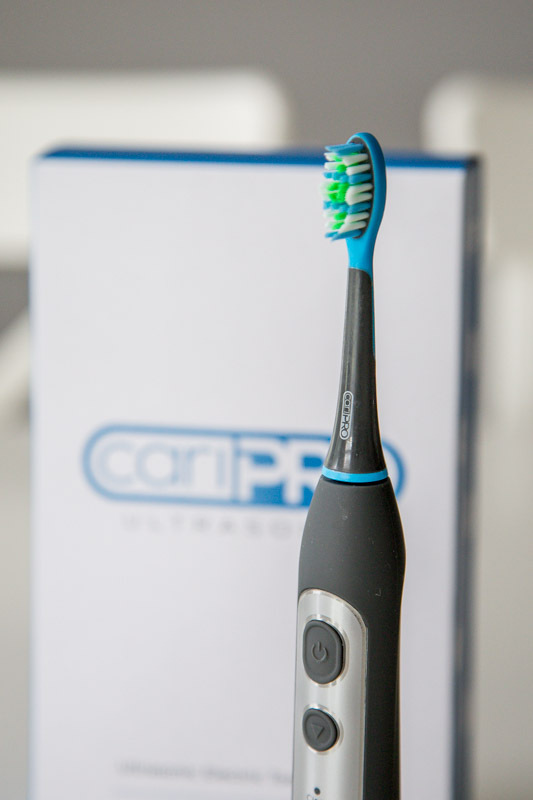 Seriously obsessed over this toothbrush! It comes with a two year full manufacturer warranty and a 60 day money back guarantee!! 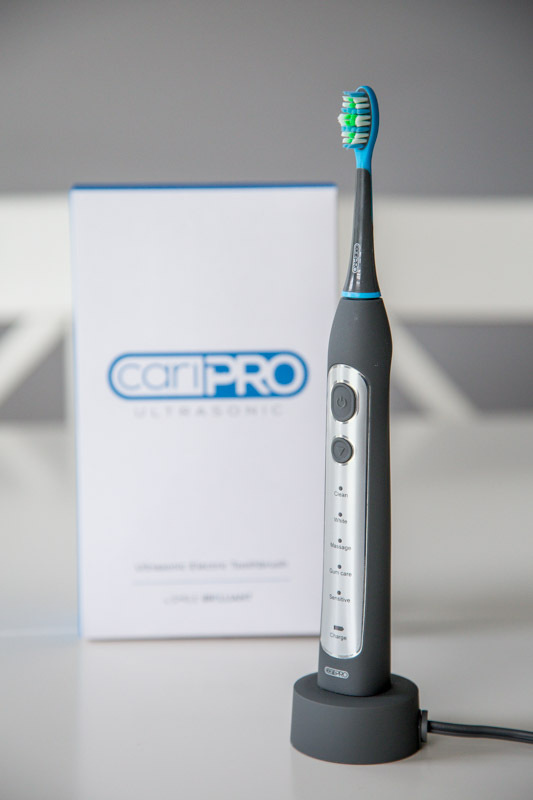 Just click HERE to claim your 20% off NOW and then let me know your thoughts and experiences with your own amazing cariPRO ultrasonic toothbrush! Top 5 Back To School Gear, Favorites and Must Haves! I might be the only mama that cries more than my kiddos do when summer ends. Summer is LIFE! 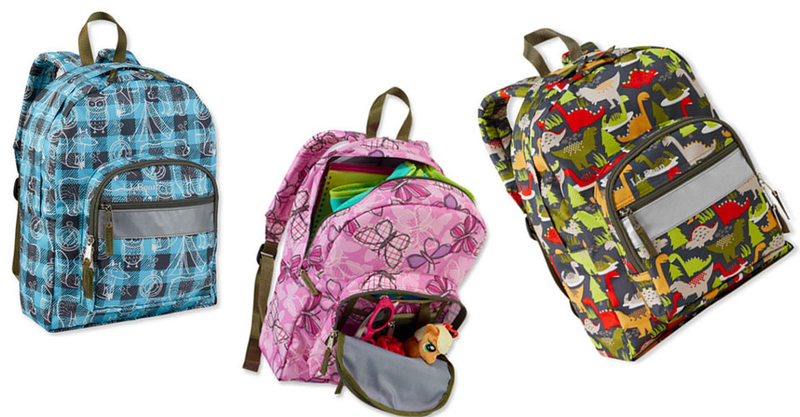 However back to school days are much less dreadful if you are armed with the best back to school gear possible, that will last and not make you feel as if you threw your money away when Christmas hits and you having to replace it all. So many food variety options open up when you can keep things cold until you're ready to eat them! 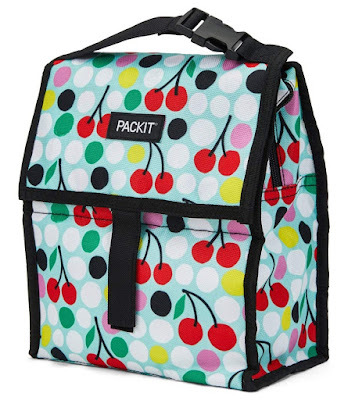 What I love most about these lunch boxes is the fact that the icepacks are built into it. No losing them! This lunch box folds up nice and compact for the freezer, then in the morning you simply unfold it, pack it, zip it up and get on your way! It has a sturdy handle for carrying, and also a clasp on the handle so you can attach it onto your backpack strap (which is also handy so it doesn't get set down somewhere, like on the bus, and then forgotten about). No spill, a spout they can chew on and not ruin completely, varying sizes for different ages, every part is easily disassembled and dishwasher safe, and replacement parts that can be found easily on Amazon HERE and locally (like in the sporting goods section of Target!). We've been using these for years and they haven't failed us yet! I know it's summer and no one is thinking about cold weather gear for their kiddos, but it's coming you guys and I don't know about you, but I'd like to have my pick instead of waiting for the cold and then being stuck with what hasn't sold out already. 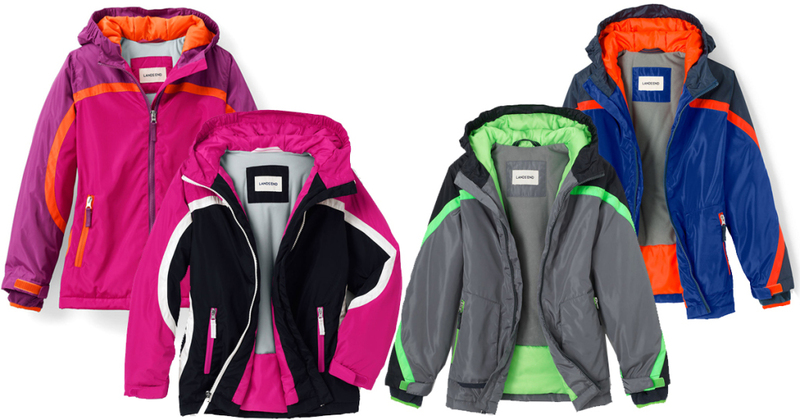 The Lands End Kids Squall Parka is our absolute favorite cold weather coat for our kids. It has a warm fleece inner jacket that attaches by zipper to an outer waterproof jacket with a hood. They can be worn separately or together. The inner jacket has thumb holes and also stretches up to 1 1/2" for a "Grow-A-Long" fit. Plus, SnowGuard sleeve cuffs! It is "Water-Wind-Cold-Kid Proof"! And my favorite part is that it is guaranteed, and has a lifetime return policy. It is a tad on the pricey side, but remember you are actually getting 3 jackets in one. A warm fleece jacket, a waterproof windbreaker, and together they form an incredible winter coat to keep your little one toasty warm on those snowy days with a LIFETIME GUARANTEE!! You just can't beat that!! hint: buy a full size or two larger than what they need and you will be able to use it for multiple years... my son used his for 5, my daughter is on year 4 with the same one. I know this sounds silly, but a good pencil can change your child's school and homework experience (and YOURS). Not only do these pencils write and sharpen beautifully, but the eraser is fabulous on it! No more smudgy eraser streaks or ripped papers. No plastic, no latex... all wood and eraser perfection! So there you have it! Those are our Top 5 back to school favorites and must haves to make life simple and less stressful! In the past 5 years I've gone through a few different watches. For various reason's, they never lasted very long with me. 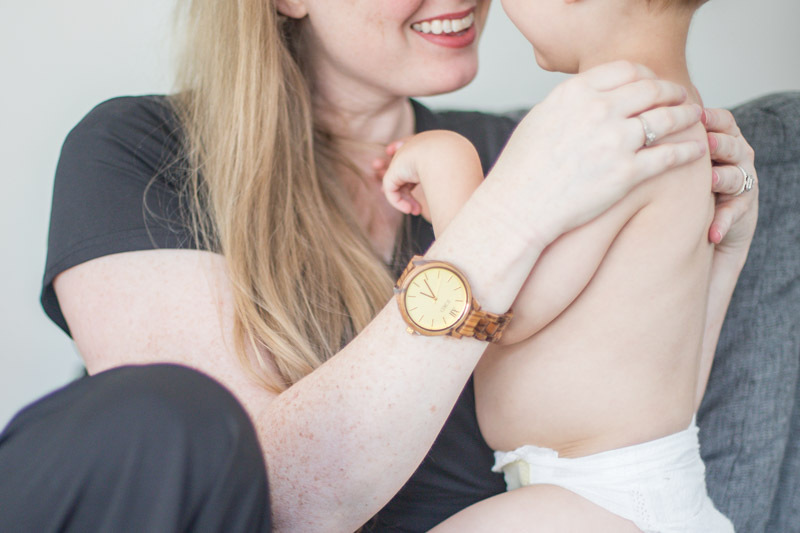 Recently though, I received a gorgeous wooden watch from Jord Watches as a gift and, oh my goodness, it is amazing! They had such vast selections of beautiful Wooden Women's watches. The watch I received was the "Frankie" series in zebra wood, with a champagne watch face. I love how unique and yet classic these wooden watches look and feel. The watch came pre-sized, specific for my wrist, and the extra links were included in the gorgeous wooden box the watch arrived in. The craftsmanship and quality of the woodwork for the box and on the watch is absolutely impeccable! The watch face is stunning and so easy to read. The champagne color looks so luxurious with the beautiful warm tones of the wood. I'm not going to lie, my husband was quite jealous! But he's got a birthday coming up and I've already started shopping their incredible selection of Wooden Men's Watches for him... but shhhhh, it's a surprise! He's going to love it so much! I'm super happy to announce that I have teamed up with Jord Watches to give you 10% off your watch, AND one lucky winner will get $100 credit to a timepiece of their own. 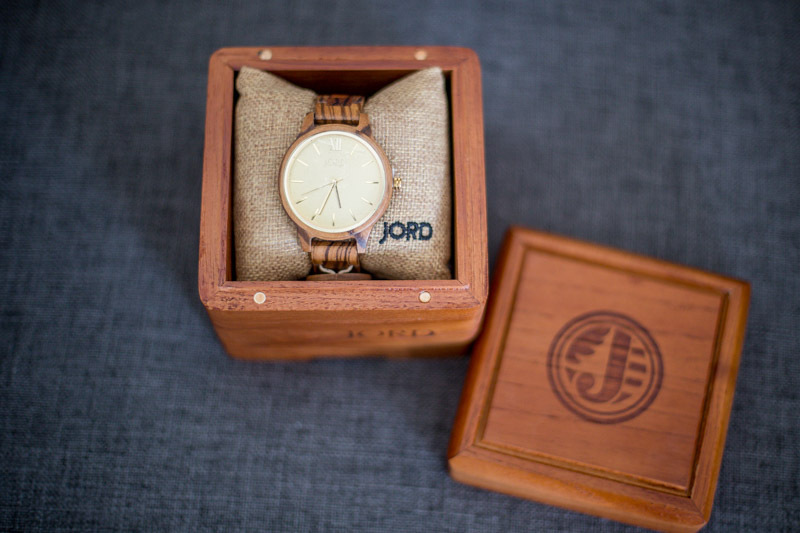 Click HERE and go to "Jord Watch Giveaway", fill out the form and you will receive an email for your 10% off and be entered to win the credit! They ship worldwide! Do it soon because the offer expires on 9/16/18! Frozen Birthday Party and FREE Printables! A Summer Of Movies! Free Printables! Illness Hacks and Home Remedies… For KIDS! likemomandapplepie.blogspot.com © 2018 Do Not copy any content without prior written approval. Picture Window theme. Theme images by Jason Morrow. Powered by Blogger.